Facials Chelsea: A Facial for Your Back? Summer is finally returning to Chelsea! People are starting to shed their winter layers and embrace the sundresses, tank tops, flip flops and swimsuits of summer. While for most people this is a time of celebration as they welcome back the warmth of the sun on their skin, for those who are suffering from back acne, it can be a time of anxiety. 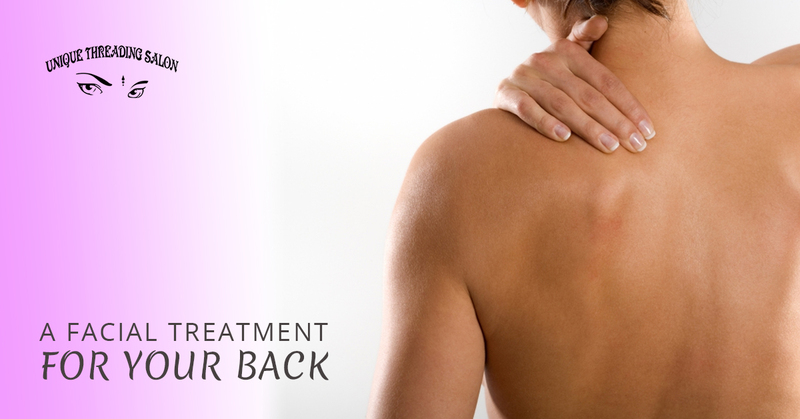 Back acne can make you feel like you need to cover up instead of showing some skin. It can cause you embarrassment, and in the worst cases, it can even be painful. You aren’t without options, though! There are a number of things you can do to help treat the skin on your back and get rid of acne so you can enjoy wearing all of those cute summer fashions. Run a bath of warm water and add some Epsom salts to the mix. Get in and soak your back in the bath for at least 20 minutes. The Epsom salts may help reduce any inflammation and help with any pain that you are experiencing from the acne. Use cleansers with salicylic acid. When you shower, use a gentle cleanser with a 10% salicylic acid solution in it. This will help clear up the acne and prevent it from coming back. Increase your water intake in order to help your body flush out toxins that could be contributing to your acne problem. Drinking plain water is best; stay away from sugary sports drinks or soda. Your back acne could be made worse by the foods you are eating. You may have a mild allergy to something you are eating and not realize it, especially to chemicals or preservatives. Cut out the junk food and eat healthier. Easier said than done, we know, but stress could be one of the things making your acne worse. Try to eliminate some stress from your life. It’s not just good for your back, it’s good for your overall health, too. Our back facials are specially formulated to treat the skin on your back and aren’t just our facial ingredients applied to your back skin. Our back facial formula is made to reduce the appearance of pimples and help your skin recover. You’ll find you have clearer, smoother, and more beautiful skin to show off this summer. Are you ready for more beautiful back skin? Make an appointment with Unique Threading Salon in Chelsea. Start working on your back skin now and you’ll be ready to start showing it off when the weather gets warmer! You can make an appointment with us by giving us a call or contacting us through our website. Do something for yourself to get ready for the summer!